Films that fail uniquely tend to leave a deeper impression than paint-by-numbers successes. 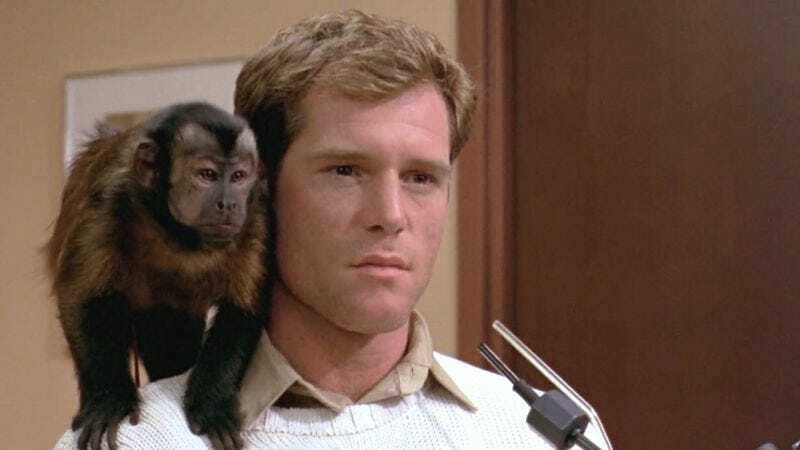 By that logic, George Romero’s Monkey Shines is one of his most memorable films. It’s not in the same league as his zombie-driven career pinnacles, and Romero has all but disowned the film, citing its chaotic, too-many-cooks creative process and failure to recoup its budget. But as “an experiment in fear,” as Monkey Shines is defined by its vestigial subtitle, it’s an interesting twist on body horror released at the height of the subgenre. Ella does just that, bonding with Allan in an oddly heartwarming montage during which she becomes his personal aide, housekeeper, and one of very few friends who doesn’t look at him with a weak smile tinged with pity and obligation. The monkey is the perfect assistant, with the initiative and can-do spirit to do Allan’s bidding without being asked. Soon, however, Ella’s empathy grows out of control as she forms a complex psychological bond with Allan and begins acting out his homicidal fantasies in exacting detail. She becomes his animalistic id, acting on desires and impulses Allan would otherwise suppress, and is really only ruminating on because he knows he couldn’t act even if he wanted to. The closest thing Allan has to a body betrays him with horrific results, making Monkey Shines thematically kin to Body Parts, the 1991 Jeff Fahey vehicle in which a transplanted arm has its own murderous intentions. That film was also a huge flop, but it was terrible, which should provide Romero some small comfort. With several filmmakers trying to occupy the same space as David Cronenberg, there were bound to be weak imitations. Monkey Shines is among them, but Romero should be prouder of it. The film is like its protagonist—lots of diabolical ideas, but an inability to execute. Availability: Monkey Shines is available on Blu-ray and DVD from Netflix or possibly your local video store/library. It can also be rented or purchased digitally through Amazon or iTunes.